On this page I have collected some key resources concerning "total brain failure," a clinical diagnosis that is legally sufficient for the determination of death by neurological criteria ("brain death"). Other pages collect statutes and court cases. In April 2018, the Harvard Medical School Center for Bioethics convened an amazing depth and breadth of expertise on brain death for a three-day conference. Materials from "Defining Death: Organ Transplantation and the 50-Year Legacy of the Harvard Report on Brain Death" are available here. 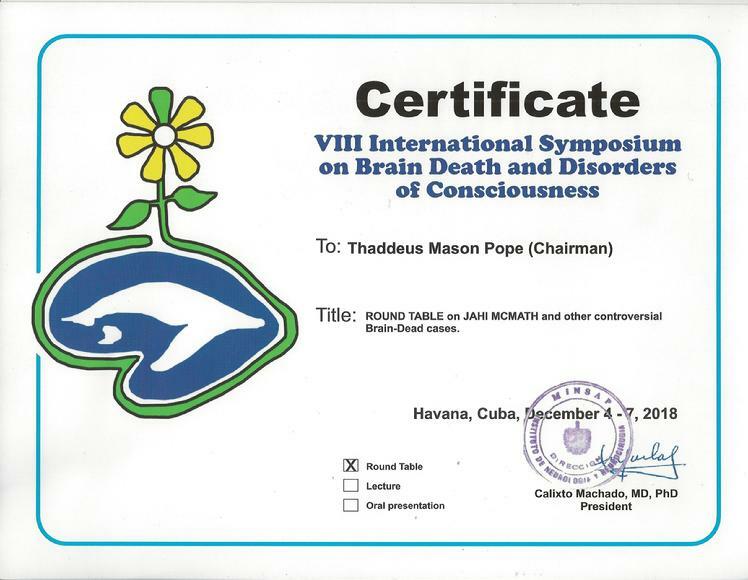 In December 2018, the VIII International Symposium on Brain Death and Disorders of Consciousness convened in Havana Cuba. The Neurocritical Care Society has develioped a "Brain Death Toolkit" available here. It includes a variety of helpful resources and educational offerings, including instructional videos and web-based courses. It also provides a sample brain death policy and checklist, which may be used as a template for adoption at individual institutions/hospitals. The Toolkit has resources to explain the pitfalls and challenges in brain death determination, and includes Frequently Asked Questions (FAQ’s), both for medical practitioners and the general public. Brain Death and the Law – Hard Cases and Legal Challenges, 48 HASTINGS CENTER REPORT (2018). Brain Death Forsaken: Growing Conflict and New Legal Challenges, 37(3-4) JOURNAL OF LEGAL MEDICINE 265-324 (2017). New Legal Guidelines for Determination of Brain Death, 14(3) JOURNAL OF BIOETHICAL INQUIRY (2017). Physician Power to Declare Death by Neurologic Criteria Threatened, 26 NEUROCRITICAL CARE (2017) (with Ariane Lewis). Legal Standards for Brain Death, 13 JOURNAL OF BIOETHICAL INQUIRY 173-178 (2016). Brain Death: Legal Duties to Accommodate Religious Objections, 148(2) CHEST e69 (2015). Brain Death Rejected: Expanding Legal Duties to Accommodate Religious Objections, in LAW, RELIGION, AND AMERICAN HEALTH CARE (Cambridge University Press forthcoming 2017) (proceedings from 2015 Petrie-Flom Center Annual Conference at Harvard Law). Brain Death: Legal Obligations and the Courts, 35(2) SEMINARS IN CLINICAL NEUROLOGY: THE CLINICAL PRACTICE OF BRAIN DEATH DETERMINATION 174-179 (2015) (with Christopher M. Burkle). Pregnant and Dead in Texas: A Bad Law, Badly Interpreted, LOS ANGELES TIMES (Jan. 16. 2014) (with Art Caplan).